CHICAGO (AP) — Christian Yelich’s easy smile and champagne-soaked T-shirt said it all. Yelich collected three more hits as the Milwaukee Brewers won their first NL Central title since 2011, beating the Chicago Cubs 3-1 on Monday in a tiebreaker game. The silky-smooth slugger stalled in his bid for the league’s first Triple Crown in decades, but he starred once again as the Brew Crew captured the biggest prize of the day. “I know how hard it is to get to this point and I’m proud to be a part of this group,” Yelich said as Milwaukee’s boozy party swirled around him, filling every inch of the cramped visitors’ clubhouse at Wrigley Field. Chicago stays at Wrigley for Tuesday night’s wild-card game against Colorado. The Rockies lost 5-2 to the Los Angeles Dodgers in Monday’s second tiebreaker for the NL West title. “It’s no fun. Of course we’d prefer the other route,” manager Joe Maddon said. It’s a quick turnaround after falling short in their bid for a third straight division title, but the Cubs will have ace left-hander Jon Lester on the mound for the elimination game. “We’ll be ready. This team has responded all year,” said Anthony Rizzo, who homered for Chicago’s run. Yelich singled home Milwaukee’s first run and won the NL batting title with a .326 average. He had 110 RBIs, one behind the Cubs’ Javier Baez, and finished with 36 home runs, two shy of Colorado’s Nolan Arenado. The tiebreakers were game 163 of the regular season and Arenado’s homer counted in the totals. Milwaukee trailed Chicago by as many as five games in September, but manager Craig Counsell’s club pushed the season to an extra day with a furious finish and then used its deep lineup and bullpen to outlast the playoff-tested Cubs. “All the guys in the ‘pen, they’re attacking the zone and putting us in a good position to win ballgames,” Hader said. Jose Quintana pitched six-hit ball into the sixth inning, but Chicago’s bullpen faltered at a key moment. 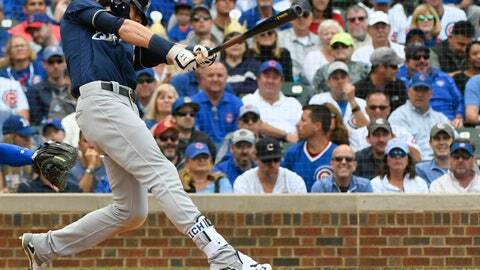 Rizzo, Baez and Daniel Murphy accounted for the Cubs’ three hits. It was more than enough for Milwaukee’s vaunted bullpen. Corey Knebel (4-3) extended his scoreless streak to 16 1/3 innings with a perfect seventh, and Hader worked two innings for his 12th save. Rizzo had one last chance for Chicago, but he flied to right with Baez on second for the final out . When it was over, Hader wrapped his arms around catcher Erik Kratz as the rest of the Brewers poured out of the dugout. A sizable portion of Milwaukee fans in the crowd of 38,450 chanted “Let’s go Brewers! Let’s go Brewers!” — a rarity at Wrigley over the past few years. Yelich also heard repeated “MVP!” chants when he singled in each of his first three at-bats. He drove in Arcia with his two-out hit in the third. “That was the big moment,” Counsell said. Chacin allowed one hit in 5 2/3 innings, setting up Milwaukee’s bullpen quite nicely. The right-hander struck out three and walked two in another solid effort in a career year. The Rockies and Cubs split six games this season, with each team scoring 33 runs.